Can you just imagine doing youth ministry or leading worship a few blocks from Notre Dame? 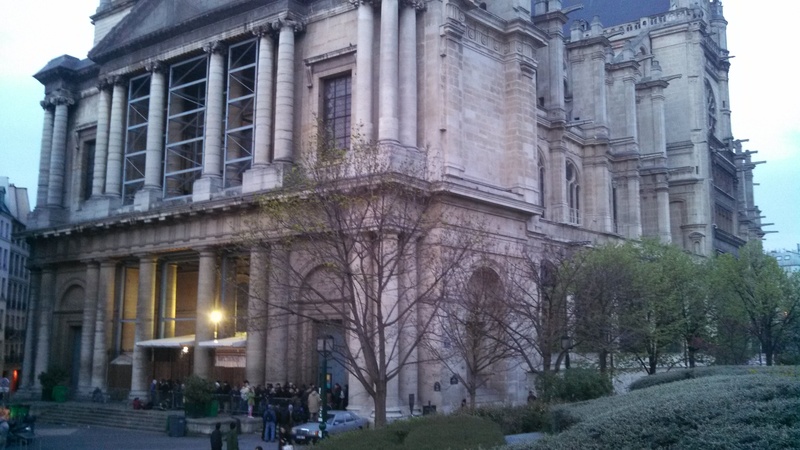 On our recent family trip to Paris, we visited several beautiful cathedrals. We saw a mass for the Crown of Thorns relic in honor of St Louis’s 800th birthday at Notre Dame, walked the labyrinth at Chartres, and were awestruck by jewel-like qualities of Sainte Chappelle. But, the most intriguing church, one that barely gets mention in any guidebook, was just a block from our hotel. Late Gothic church where Mozart held his mother’s funeral. 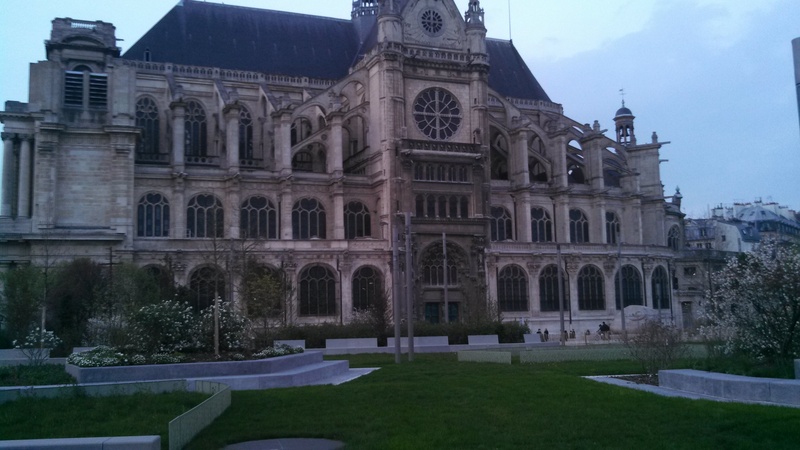 From the outside, St. Eustache has all the Gothic grandeur of more famous cathedrals. There have been some notable Baptisms and funerals there. The interior chapels have some paintings by Rubens. You might expect a line, a brochure for visitors or a donation box but you’ll be lucky to spot the humble entrance. Upon entry you’ll be struck by the vaulted ceilings, rose windows and the empty quiet (especially if you’ve just jostled your way through the crowded Notre Dame). On the day I visited, there were a number of individuals escaping the drizzle, presumably with their life’s possessions in the bags at their feet, heads nodding in upright rest. As I meandered around with only a handful of others, gazing at the stained glass with miniature binoculars, I came across a few signs by a side door which outlined the church’s mission. Their purpose was clearly laid out, even for a non-French speaker like me: Spirituality, Arts and Solidarity. From my brief visit, I could see that their written goals are being put into practice. I witnessed solidarity with the neighborhood and its people each night as we passed by on our way to dinner. Hundreds lined up near the entry for a warm bowl of soup. One evening, while dining at a nearby restaurant, we watched the merchants begin to close up shop. As if on cue, a group of four people wearing blue “Soupe” vests appeared pulling a matching wagon. They waited as bread and extra food was brought out from the closing bakeries and markets. Back in my hotel, an internet search yielded very little information on the history of the church. But, I did learn that this free meal ministry has been going on since the 1980’s. Solidarity has been their focus for decades. So, do they wish they had the money to make repairs to their aging building? My guess is yes. Do they wish they had more tourists? More fame in guidebooks? I don’t know. But it did seem to me that they have claimed their identity as a church that serves the hungry and that they do it well. They are a place where weary people might take rest out of the rain. A place that collects the excess of the thriving restaurant area nearby and transforms it into a warm meal for hundreds. Maybe being overshadowed the more famous Notre Dame lets them do their work without the pressure of pomp and expectation or a security guard to shoo away those who just need a dry place to sit. I am guilty of occasionally wishing my church had something that other churches have. But, when I think of St Eustache and their unique identity, I realize I wouldn’t want our church to be any other. We ave our very own purpose and identity. As we often tell our kids, “just be you.” Celebrate who you are. God calls each individual and each church into a unique identity. I’ve often struggled with this as well…wanting ministries that others have. I’d love to have a youth praise band, a children’s choir, an intergenerational basketball/volleyball/softball faith-based league, a gym, a labyrinth, etc. etc. The thing is, some of that even fits with our mission, with our culture, with our identity. Yet it seems there are so many outside influences that keep us from being true to our purpose/mission/identity. Just as individuals struggle to be authentic to who we want to be, so do churches. Once we get past the comparison game and really look at ourselves, the barriers stare us down and it’s so much easier to resort back to comparisons than doing the hard work of figuring out how we overcome our own struggles to live out who we want to be. You are so right; it is much easier to compare and to use barriers as excuses. I don’t want to make the process of identifying a purpose or mission sound easy. I’ve sat on plenty of visioning teams and have found the experience to be exhausting, yet usually worthwhile. this post and your comment reminds me of this book I read in our Missions class at Pfeiffer: http://www.amazon.com/Treasure-Clay-Jars-Missional-Faithfulness/dp/080282692X – It looks at various patterns of missional faithfulness in churches and the first chapter is on missional vocation and identity; discerning what gifts your community has and how to match them with the needs of the community. This is such great thinking! I remember my pastor always saying God places many churches with many different styles and personalities and there is not just one right one, they are all meant to reach different types of people.